Most everyone that has used an ATM at a bank knows the NCR name. 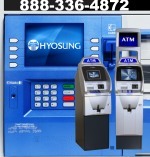 NCR has been manufacturing outdoor ATM units for many years. We used to sell NCR outdoor ATMs through our partners by request. We no longer sell NCR branded ATM units. We can get almost any feature on an equivalent ATM that you request. Call us for pricing and availability. NCR ATM units are no longer available from OutdoorATM.com. Call us for current outdoor models from other manufacturers.